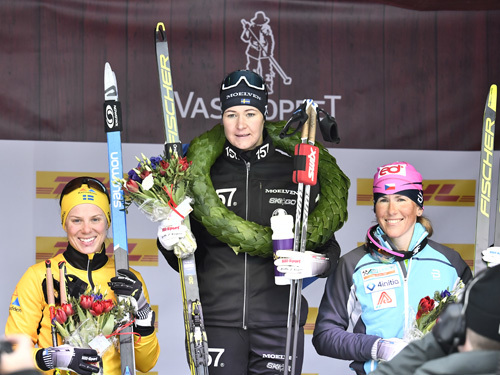 Britta Johansson Norgren, Sollefteå Skidor IF, won the 31st Tjejvasan one second ahead of Lina Korsgren, Åre Längdskidklubb, and four seconds ahead of Katerina Smutná, the Czech Republic. "I felt it had paid off when I pushed during the race. I had a great amount of energy," says Britta after her third Tjejvasan victory. There were 7,100 registered for Tjejvasan 2019. Minus two degrees at the start at 09:00. The quartet of Johansson Norgren, Korsgren, Smutná and Laila Kveli were strongest throughout the race. Britta increased the speed several times to feel out her competitors, and it was only the trio that could fully keep up. The leading group shifted between four and eleven skiers again and again. Going into the Hemus terrain, with five kilometres left, there were eleven skiers in the group. Laila Kveli was in front, heading down one of the steeper inclines when she lost her balance and fell. Others in the group just narrowly avoided getting pulled down too. Disappointing for Kveli, though she bounced back quickly and was able to catch up before the final stretch, coming in at fifth place. Johansson Norgren led the way onto the final stretch on Vasagatan in Mora. Lina Korsgren was second, in a good position, but Britta turned out to be strongest on the long finishing stretch. “I felt it had paid off when I pushed during the race. I had a great amount of energy. My muscles still felt strong and I’d gotten a good amount of fluid in me,” Britta explains. You pushed hard several times and then slowed the pace; you must have noticed that many couldn’t keep up! Katerina Smutná was also happy with her results even if she couldn’t defend her victory from last year. Emma Wikén came in as fourth just ahead of Laila Kveli in fifth place. It was impressive to see Kveli come back despite a fall so close to the finish. Overall Britta pushed hard directly from the start and already at the Oxberg checkpoint there were nine skiers in a leading group, separated from the rest. 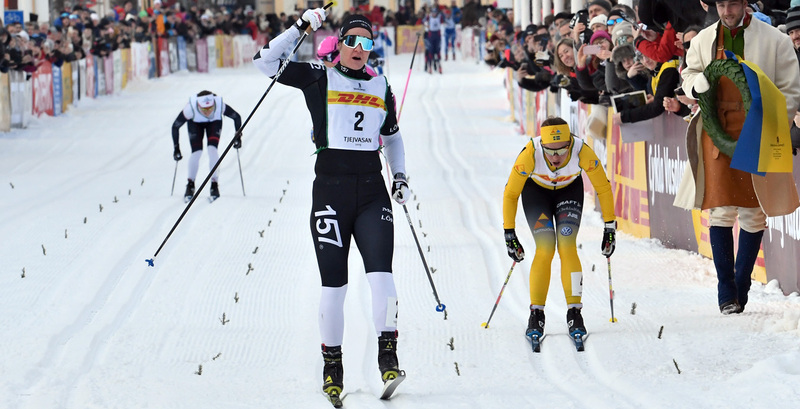 Lina Korsgren was first to Hökberg, taking the spurt prize narrowly ahead of Britta Johansson Norgren, Katerina Smutná, Laila Kveli, Elin Mohlin and Frida Erkers, all passing within five seconds. At the Eldris checkpoint there were eleven skiers again, all within ten seconds. These eleven were all part of the leading group down to Mora Parken before the battle on the final stretch. First prize in Tjejvasan 2019 is 50,000 SEK. Individual prizes are awarded in the form of training scholarships for a combined total of 147,000 SEK. Best hurdlers: Susanna Kallur (right) 2.29.09 and Jenny Kallur (left), 2.30.05. Best pop artist: Linda ”Miss Li” Karlsson (4052) 3.00.25. Susanne Nyström (6 wins), Britta Johansson Norgren (3 wins), Anna Frithioff, Marie-Helene Östlund, Elin Ek and Sofia Bleckur (2 wins each). Susanne Nyström (7 top-three positions), Sofia Bleckur and Britta Johansson Norgren (5 each), Elin Ek and Emelie Öhrstig (4 each), Anna Frithioff, Jenny Hansson, Emilia Lindstedt and Katerina Smutná (3 each). 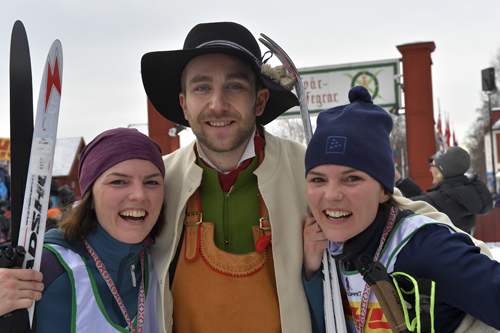 Want to ski Tjejvasan 499 years after Gustav Vasa’s adventure in Dalarna? 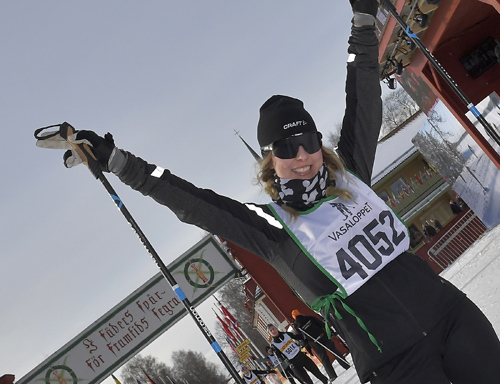 Registration for Tjejvasan 2020 open on Sunday, March 17 at 09:00 on vasaloppet.se. The race runs on Saturday, February 22, 2020. Fri 22 Feb: Kortvasan. 30 km. Start Oxberg. Sat 23 Feb: Tjejvasan. 30 km. Start Oxberg. Sun 24 Feb: Ungdomsvasan. 9/19 km Start Eldris/Hökberg. Sun 24 Feb: Öppet Spår Sunday. 90 km. Start Sälen. Mon 25 Feb: Öppet Spår Monday. 90 km. Start Sälen. Tue 26 Feb: Halvvasan. 45 km. Start Oxberg. Fri 1 Mar: Stafettvasan. 9–24 km. Five-person teams. Start Sälen. Fri 1 Mar: Nattvasan 90. 90 km. Two-person teams. Start Sälen. Fri 1 Mar: Nattvasan 45. 45 km. Two-person teams. Start Oxberg. Sat 2 Mar: Blåbärsloppet. 9 km. Start Eldris. Sun 3 Mar: Vasaloppet. 90 km. Start Sälen.